May 5/6 2018 Practice and Championship Registration is Open! Practice entries are limited, so don't delay! We're also looking for a Course Designer (position filled: Reed stepped up! ), Worker Chief, Tech Chief (position filled: Vereker) and a Safety Steward (position filled: Nakata stepped up for SSS!) if anybody is interested in stepping up for the club! PM, IM, Facebook IM, or post here if you have any questions or are interested in learning more about how to train for one of our chief positions! Last edited by Randy Gonzalez on Wed Apr 25, 2018 7:02 am, edited 2 times in total. Re: May 5/6 2018 Practice and Championship Registration is Open! Per the registration flyer, the Jr karts run first thing on Sunday. It worked out great last event and I would like to keep it the same for future events. Yeah, we'll run the karts first again. I agree that worked out well. Let me know if you hear of any problems created for any of the other karters. I wanted to give a big thanks to Randy for getting me all situated. See everyone in a couple weeks! I should be available to do course this event. I have that Friday off! If anyone is interested in learning course design and is interested in shadowing me please let me know! Greg Debert wrote: I wanted to give a big thanks to Randy for getting me all situated. See everyone in a couple weeks! Hey Greg, I just checked your registration and all is good with your new number! You're in for a whole weekend of fun! Welcome to the club! Reed Gibson wrote: I should be available to do course this event. I have that Friday off! Randy, I can do worker chief for Sunday only (if someone wants to split the job for Saturday as I won't be there). I can also help at reg Sunday morning if you need bodies. Lauren Kane Porta wrote: Randy, I can do worker chief for Sunday only (if someone wants to split the job for Saturday as I won't be there). I can also help at reg Sunday morning if you need bodies. Thanks Lauren....Sunday registration would be a big help....and if nobody else surfaces, we'll get you on the hook for Worker Chief as well! Back by popular demand! 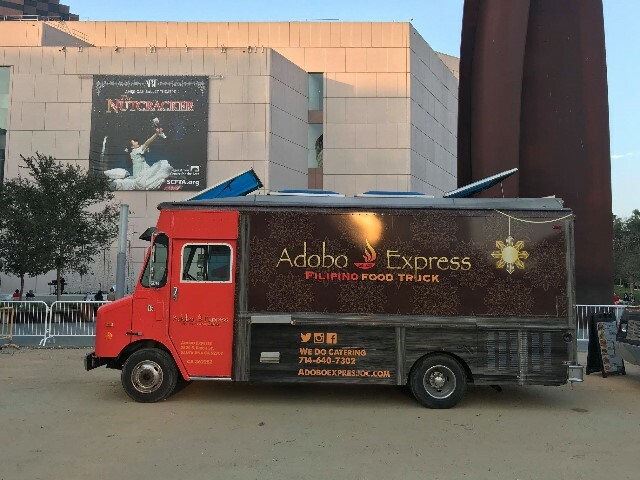 We've got the Adobo Express food truck coming out to the May 5-6th event! They will be there at 8:00am both days and they have a breakfast menu. Save yourself some time by grabbing breakfast and lunch at the event and support our vendor! I received several positive reviews from our members at the last practice.....and they had bottled cream soda (which I though was a nice change from the typical soda/energy drink fare). See ya all out there! Anybody have an opening for a tire warmer for this event? It's the first weekend this year I haven't had a scheduling conflict! Robert: My Chevy Bolt is all alone in H Street at the moment. I MIGHT have a friend in Novice on Sunday so maybe 3 drivers can run that way. I don't think he'll drive on Saturday. Tires are Nexen SUR4G, I've also got spare Hankook RS4s mounted up in case the Nexens cord. Hoping for a Sunday ride, and I know management prefers to keep multi drivers to 2 per run group. If I make it over on Saturday, I’ll try to look you up and see if I can’t help you out. Vereker Tam stepped up for Tech Chief. Thanks Vereker! Run order has been updated. Several classes from Group 3 have been moved to other groups. Per the enlistment flyer, the Jr karts run first thing on Sunday. It worked out awesome last occasion and I might want to keep it the same for future occasions. Ralph Skiles wrote: Per the enlistment flyer, the Jr karts run first thing on Sunday. It worked out awesome last occasion and I might want to keep it the same for future occasions. Although this is an old thread, just FYI: In working with the kart participants and event staff (worker chiefs, timing, etc. ), we've decided (for the time being) that running karts first will be our standard operating procedure going forward. Thanks for your input!